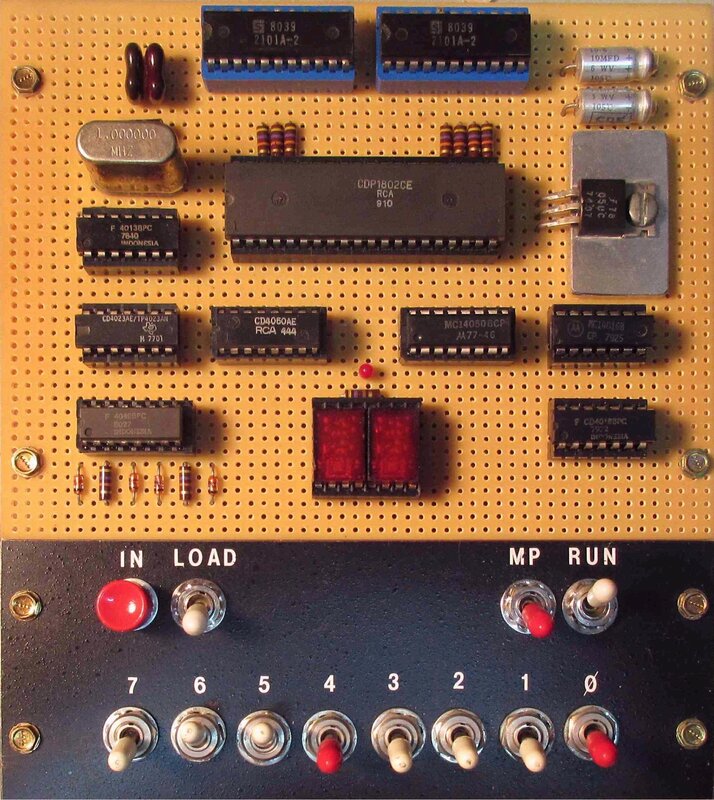 The August 1976 issue of Popular Electronics magazine had a breakthrough project on the cover. "The COSMAC ELF: A microcomputer trainer that's powerful, expandable, and costs as little as $80." (Click on the magazine cover to read the original article.) To put this in perspective, the Apple I was selling for $666.66 at the time; and the Apple II didn't even exist yet! The ELF truly was a simple inexpensive computer. Thousands of people built it (including us)! In the process, we learned about computer hardware and software right from the ground up. This experience is largely lost today, when everyone simply buys everything already built and programmed for them. 2016 was the 40th anniversary of the ELF. In honor of the occasion, we decided to recreate the original ELF at the Vintage Computer Festival Midwest in Chicago IL on September 10-11, 2016. To give people a "taste" of what it was like, visitors to our booth had all the parts and tools needed to build a real COSMAC ELF. This was a wire-wrap project -- no soldering at all! We showed folks how to wire-wrap, so by the end of the show, participants had almost finished a complete vintage computer from scratch. This computer was then raffled off. Everyone who added at least one wire got to put his name on a raffle ticket. At the end of the show, we drew the winning ticket out of a hat. One lucky builder won a FREE genuine hand-crafted COSMAC ELF computer! 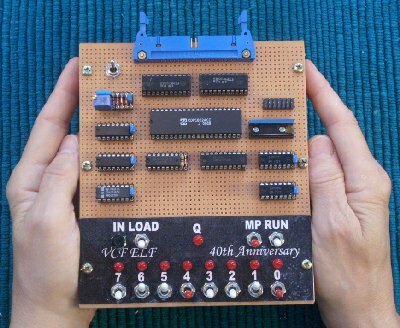 The photo is our 40th anniversary recreation of the original Popular Electronics Elf. Click here or on the photo for a movie of the VCF-ELF in operation. Popular Electronics Aug 1976. 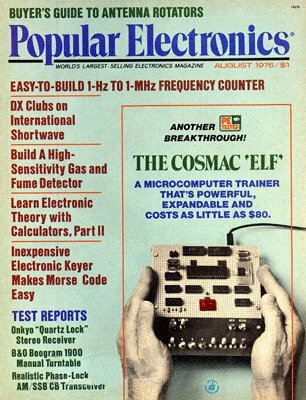 The magazine article that introduced the COSMAC ELF. Entire Popular Electronics Aug 1976 issue. The article starts on page 33 (it's big; 8.8 megabytes). Josh Bensadon's Elf is a faithful build of the original Elf shown in the PC articles. Josh's Elf Schematic. A beautifully redrawn exact copy of the original. 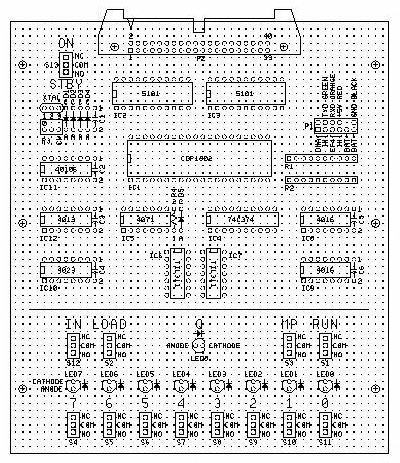 Lee' VCF-Elf schematic. Ugly, but it has all the fixes described below. Lee's VCF-Elf layout. to match the schematic above. 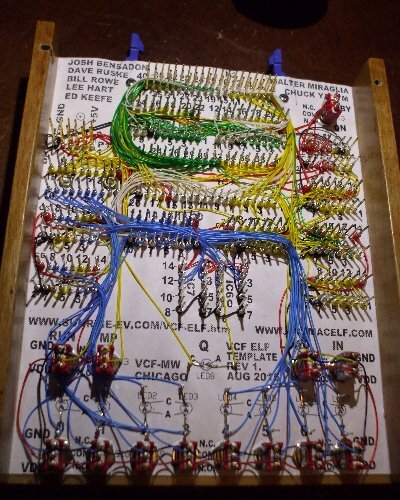 This is the FRONT view of the board showing where the parts get placed. Josh's Wiring Templates provide the black label for the switches and lights, and identify the pin numbers for wire-wrapping the BACK side of the board. Template with TI TIL311 hex displays. Template with HP 5082-7340 hex displays. To build your own VCF-ELF, be sure to print these templates ACTUAL SIZE. Wire-Wrapping primer from Jonard Tools (formerly OK Tool). Wire-wrap list is a to-from checklist for all the wires, written by Lee, Norm, Josh, and Chuck. The 1802 Membership Card and Lee's other 1802 stuff. VCF Midwest Vintage Computer Festival Midwest official website. Here's the VCF-ELF parts list, in case you want to build one for yourself. We used premium vintage parts wherever possible to keep the "look and feel" of the original; but there are cheaper alternatives if you're on a budget. Located just above data switches. More logical to use with individual input switches. - Hex displays take 10x more power than everything else put together! Implementation: Replace buffers IC4-IC5 with 74C374 octal latch IC4. - Latch needed for individual LEDs. - High drive: Can drive individual LEDs, hex displays, or both. - Can also be used as a general-purpose 8-bit output port. Add bypass capacitors (an obvious oversight in the original article). Replace electrolytics C1-C2 with ceramic capacitors C1-C6. Extend 14-pin IC sockets to 16 pins, and put bypass capacitors in the extra pins. Replace diode-resistor OR gates with a 4071 quad 2-in OR gate IC5. Two sections replace D1-D4 and R8-R9. Third section replaces IC5 pins 14-15 (buffer for RUN switch). Fourth section replaces IC11 14-15 (buffer for Q LED). IC count remains the same, and we've eliminated 6 discrete parts. Replace individual pullup resistors with SIP network R1-R2. Easy to mount in IC wire-wrap socket. Includes series resistors for individual data LEDs. Use 1.8 MHz ceramic resonator in place of crystal. Has internal capacitors (eliminates old C3-C4). Easy to mount (plugs into normal IC wirewrap socket). Frequency correct for 1861 video, and serial baud rates up to 9600. Replace R11 with 5 meg trimpot R3. Makes clock frequency adjustable (10KHz-2MHz). - Adjust it near 1.8MHz and it "locks onto" the resonator frequency. Wire unused section of flip-flop IC12 to latch address bit A15 and /A15. Allows simple memory expansion. A15=0 selects 0-32k, /A15=0 selects 32-64k. - Example 1: Two 2114s in place of two 5101s provides 512 bytes. - Example 2: Expansion board can have one RAM at 0-32k, one EPROM at 32-64k. Added /DIS input, with pullup resistor. Expansion boards can pull /DIS low to disable on-board memory and replace it with external memory. Add serial I/O (using Q and EF3). 6-pin header (P1 pins 2-4-6-8-10-12) mates with Sparkfun FTDI USB-serial cable. Need to load "bit banger" serial loader program to make it work (~40 bytes). Resistor R4 in series with Q output prevents damage if VCF-ELF is powered and FTDI is not. Diode D5 in series with EF3 input prevents damage if FTDI is powered and VCF-ELF is not. Jumper P1 pins 1-3 to enable LOAD switch to control DMAIN (saves a diode). Jumper P1 pins 5-7 to enable IN switches to control EF4 (saves a diode ). - Connect USB 5v supply + to P1 pin 8, - to P1 pin 12. - A Sparkfun FTDI serial adapter has the right pinouts to provide both power and serial I/O. - Connect 3-cell AA battery holder + to P1 pin 9, - to P1 pin 11. - Battery holder fits underneath switches. - With battery connected, STANDBY powers RAM to maintain its contents. - Diodes D1-D4 prevent back-feeding power between battery and external supply. - Wire-wrap pins (no soldering, easy to change). - Mates with standard female IDC ribbon cable sockets. - Mounting screws securely hold it to the board. - Ejectors avoid pulling on cables to unplug. Expansion board can lay horizontally, with edge supports just like the Elf board (so expansions extend the Elf rearward). - VCC pin 16 replaced by /DIS input with pullup resistor. - CLOCK pin 1 replaced by /A15 output. Pins are in the same physical locations as the 1802. - Pin numbers changed, because ICs and headers number their pins differently. Minimal parts needed for expansion. - Memory expansion to 64K only 3 ICs (one 74HC373 high address latch, one 32k RAM, one 32k EPROM). - Video expansion only one IC (1861). The VCF Elf project would never have been possible without generous donations of time and materials by Lee A. Hart, Josh Bensadon, Ed Keefe, Dave Ruske, Walter Miraglia, Chuck Yakym, Bill Rowe, and Norm Nelson; and to our many advisors and volunteer builders. A hearty THANK YOU to everyone that helped to bring this delightful project to completion. If your circuit's strange, and it don't work good. Who ya gonna call? Wire Rappers! If it's got to change, if you only could. Don't pack no heat, no boards fulla lead. What 'cha gonna use? Wire Rappers! No burns or fumes, gonna wrap instead. 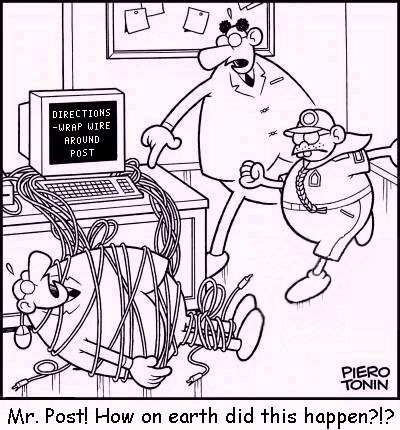 Just place that wire, on the right pin. What is it called? Wire Rappers! Now wrap it on, with a clockwise spin. That's what we call, Wire Rappers! Ain't no big sweat, if you get it wrong. What ya gonna use? Wire Rappers! 'Cause it un-wraps too; move it where it belongs. Vintage Computer Fair ELF © 2016-2018 by Lee A. Hart. Created 8/10/2016. Last update 10/24/2018. Go to TOP ........ Go to HOME ........ Questions? Comments? Email me for details. Web hosting provided by Innovative Computers.